Four Stars ~ A laugh-out-loud historical romance with lovable characters, some of whom are quirky and fun to be around and some who try to be matchmakers with unexpected results. Gwyn brings the Old West alive, and readers will not be disappointed with her latest offering. What a delightful debut! A Bride Opens Shop in El Dorado, California reminds me of the classic romantic comedies where two stubborn, independent people keep denying what everyone else knows is true: that they were meant for each other. I found myself eagerly turning the pages, wanting to see what was going to happen to Ellie and Miles next. With witty dialogue, charming characters, and an attention to historical detail that will make you feel you’re living in frontier California, you’ll love every moment you spend in El Dorado, CA with spunky, resourceful Elenora Watkins and determined, debonair Miles Rutledge. Keli Gwyn’s debut historical romance is a winner! 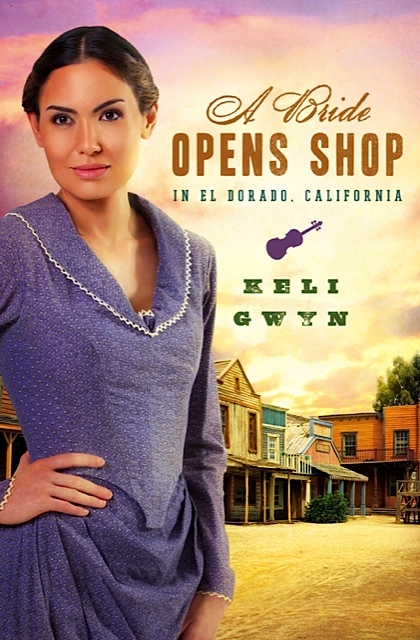 Keli Gwyn’s A Bride Opens Shop in El Dorado, Californiais a fresh and lively tale of two strong, yet wounded people battling to outperform each other with rival shops, with violins, even with pistols. As Elenora and Miles come to terms with past hurts, they gradually shift from self-seeking to self-sacrificing, proving the power of God at work in their lives and bringing a most satisfying ending. Keli Gwyn brings the Sierra Foothills to life with rich historical details. She’s crafted delightful and unique characters that make a home in your heart. The tender and sweet romance has plenty of sparks to keep you turning the pages. And when you reach the last page, you’ll breathe a satisfied sigh but at the same time wish this lovely story didn’t have to end. Keli Gwyn is a fresh new voice in Christian fiction. A Bride Opens Shop is filled with characters who leap off the pages, a story line that wouldn’t let me go, and historically authentic details that delighted me. I will anxiously await the release of her next novel. Keli Gwyn brings old California alive with a story that’s filled with faith, hope, and love. When a willful widow matches wits with a competitive shopkeeper you just know there will be fireworks. The battle of the sexes has never been so much fun. Highly recommended! A Bride Opens Shop in El Dorado, California is an effervescent story full of such small town charm that you might think Little House on the Prairie had jumped on a stagecoach and headed for the wild west! Author Keli Gwyn’s vivid historical settings and gentle humor will endear her to readers of sweet romance. book with them. They will enjoy it as much as I did. Thanks for taking time to leave me a comment. I’m glad you enjoyed Miles and Ellie’s story. I had such fun writing it and bringing this history of this beautiful area where I live to life. I’ve moved my blog to my pretty, new website. You can find it at http://www.keligwyn.com.